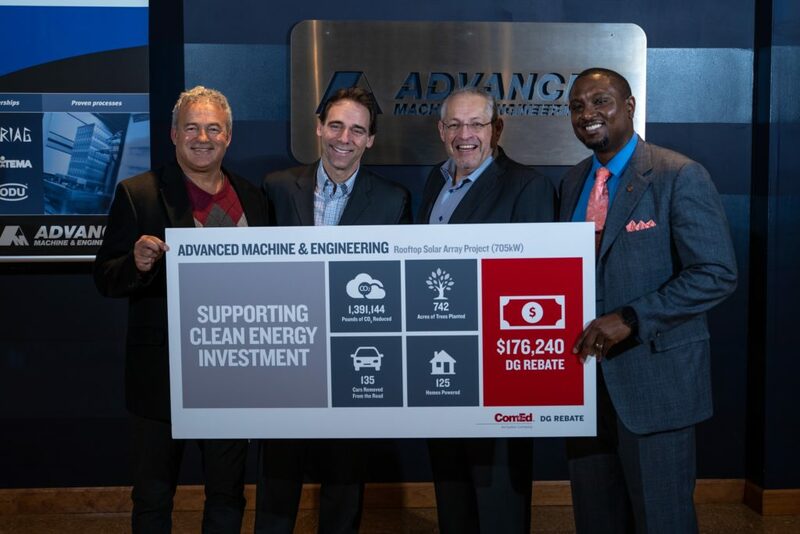 Advanced Machine & Engineering Co. (AME) started in 1966 in a small 1,000-square foot office space in Loves Park, Ill. Last month, it received a check for $176,240 for installing 2,200 solar panels covering 65,960 square feet at its manufacturing headquarters in Rockford. AME’s 705-kilowatt array is the largest solar installation in the Rockford area. ComEd began accepting applications from commercial and industrial customers in December for the distributed generation (DG) rebate program, which pays $250 per kilowatt of installed solar power capacity. The rebate aims to reduce upfront installation costs and spur renewable energy development. Going solar is consistent with AME’s mantra to “be efficient, be effective, be advanced”, according to company leaders. The company invested $870,000 to install the panels in 2017, and it has more than paid for itself thanks to ComEd’s rebate, along with state and federal tax credits and lower utility bills and taxes, said Marika Goellner-Mertz, secretary and treasurer. A family-owned company, AME was founded by Marika’s father, Willy Goellner, chairman, who immigrated to the U.S. from Germany in 1958. He moved the company from Loves Park, Ill., to Rockford in 1968 and expanded the AME footprint to 33,371 square feet. In 1999, AME acquired German-based Hennig, Inc., the leading manufacturer of machine tool protection, chip conveyors, and coolant filtration systems. By 2017, AME had two plants in the U.S., three more in Europe and joint ventures in China, Germany, England, and India. Dietmar Goellner, the eldest son of Willy, is president and CEO of AME. Dietmar’s son, Alex, is an accounting supervisor. The growth of AME has further cultivated the global view with which it was founded. This applies especially to environmentalism, according to chairman Goellner, who has installed solar panels on his home. “We know what we’ve been doing to our world through pollution, exhaust systems, and things we’re throwing in landfills that shouldn’t be in there, so the more that we can do with solar energy to help save our world, the better,” said Willy, who still comes to the office six days a week. In 2018, he was named one of the “People You Should Know” by the Rockford Chamber of Commerce.